When you think of Christmas and West Allis what comes to mind? Candy Cane Lane, of course! If you’re not familiar with Candy Cane Lane, it’s 12 square city blocks lit up with all sorts of Christmas lights, themes and decorations. You can drive through it (expect a lot of waiting time) or walk through it. It’s quite the fun if you’re someone like me who loves Christmas and lights. West Allis is a special community to Terri Lodwick. She grew up there, went through the school system, and as a teen even cruised down Highway 100 in her dad’s pickup truck! We’ve done many West Allis 4th of July and Christmas parades and yes, our float started on fire one year – oops!! We’ve been a member of the Chamber of Commerce for over 20 years and have done TONS of work on homes throughout the community. The Wisconsin State Fair Park has been home to many trade shows for us during the last 34 years. 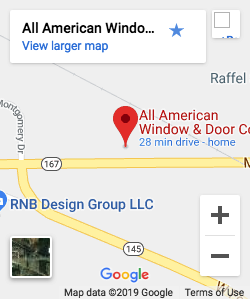 Each month All American Window and Door Co. and WTMJ team up for the All American Window and Door “We Love Wisconsin” tour. 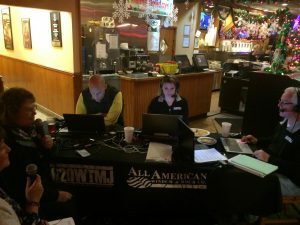 Gene Mueller and his morning crew do a live broadcast, highlight the community, and feature the city throughout the morning show. We’ve been to many cool places and restaurants from Green Bay to Madison, Kenosha to Bay View. This morning, we were at Johnny V’s restaurant in West Allis. It’s an old fashioned diner, open 24 hours a day, decorated with coke items and a nostalgic theme. There was a large crowd for breakfast. 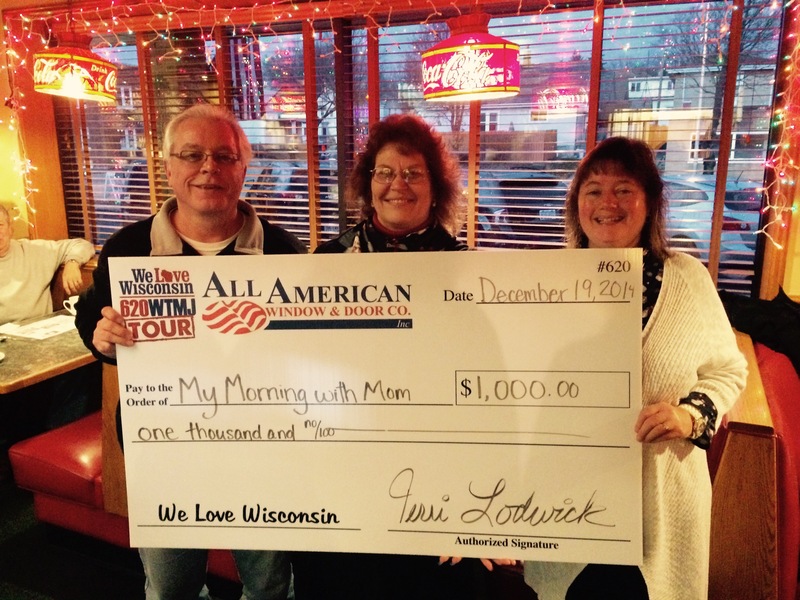 This morning All American Window & Door donated $1000.00 to My Morning with Mom (MMWM) and spoke on-air with Beth Rogahn. Beth has been a part of this support group for many years. She is the facilitator and clearly has a passion for new moms and babies. She is a very sweet and gracious person. Terri and Beth made fast friends and each had tears in their eyes as Terri presented her with the $1000 check. Terri can never give the money to her chosen charities without crying!! My Morning with Mom is a great resource for mothers and mommies-to-be! The group originally started at St. Luke’s Hospital and has branched out to West Allis Hospital Women’s Pavilion. It’s a completely free support group. It’s pretty awesome – they plan and organize meet ups or play dates throughout the week. A few have even done night outings for Moms. They do special projects and even invite dads to special events. This group gives mothers and their babies support, experiences with each other, conversation, and an actively involved health care professional to answer questions. So, Mom’s, if you’d like to get involved and participate in an amazing organization, please consider joining My Mornings with Mom! Thank you, Beth, for allowing us to be part of your awesome organization!